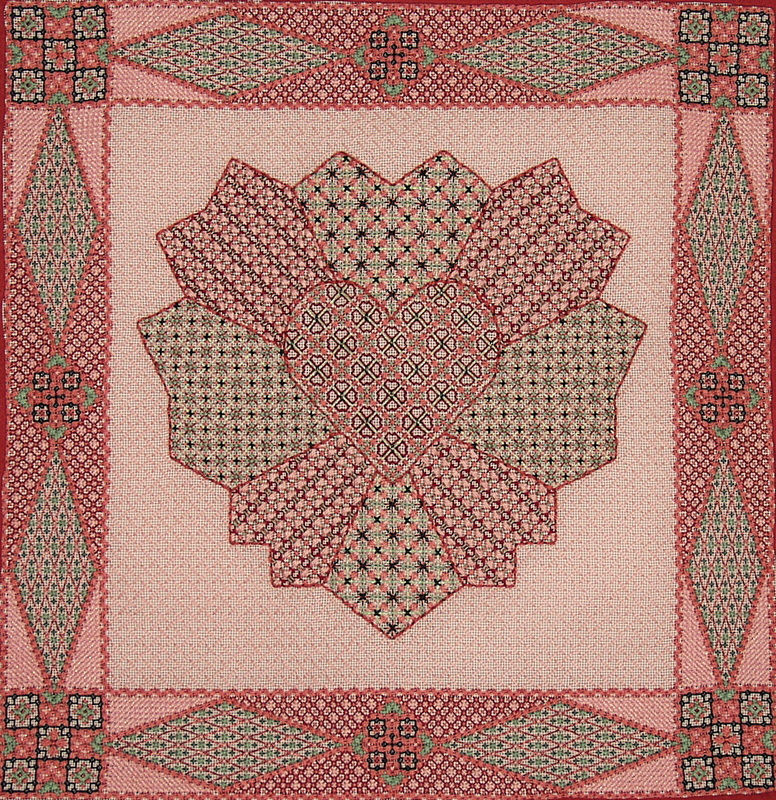 Finished Design Size: 13.25" x 13 .25"
Dresden Heart is a patchwork of dramatic pattern that was inspired by the classic quilt pattern with the same name. The centerpiece heart is defined with an Assisi style back stitch outline, and the border segments are defined with a unique flip-flop Diagonal Hungarian outline that resembles rickrack. Most of the highly textured inner fillings of both sections are open couching patterns with simple canvas and/or blackwork accents that fit the unusual shapes gracefully with no awkward compensation. This design offers a smorgasbord of interesting composite patterns for the intermediate level canvas embroiderer. The design would make a lovely wedding pillow or framed piece. It could also be mounted as an insert for a tote bag like the original model. NOTE: The instructions are written using the color combination of the original model, which is a complementary pink-cranberry and green color scheme. Use the value references provided to make the appropriate substitutions for alternative color combinations.